Could you imagine your life without your pets? If life isn't complete without Fluffy and Fido, you may be thinking about a way to involve them in this season's festivities. How about a special gift, just for them? 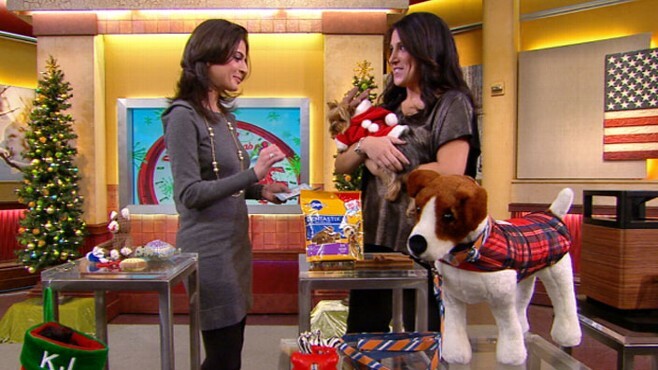 Maggie Gallant, a pet and lifestyle expert, appeared on "Good Morning America" today to discuss affordable gift ideas for the pets -- and pet lovers – in your life. Outfits available for the holidays are cute, and they make adorable photo ops. Keep a camera nearby so you don't miss it. These gifts can be life-savers for people who are always brushing pet hair off their clothing and furniture. The Furminator is a small, hand-held device for grooming pets. It reduces shedding by up to 90 percent for dogs, cats and bunnies. Kiehl's Spray-N-Play cleansing spritz is perfect for when you don't have time to shampoo and condition your pet's coat. It adds shine and smells fantastic. Pet Bowl: Fill it with treats or a favorite meal and watch them drool. For the celebrity-obsessed, art lover and tech nuts, these celebrity dog toys allow your favorite pooch to mingle with A-listers such as Brad Pitbull, Sarah Jessica Barker and Angelina Growl-lie. Organic isn't just a trend for humans, but for our best friends. These organic cat toys are good for kitty's pearly whites. The Hanukah toys are extra fun because they allow you to bell the cat. It's important for our furry friends to have fresh breath when company comes over. Dentastix are a great stocking-stuffer, especially since most dogs who are more than 3 years old suffer from gum disease. This is the big splurge item, and it's great for people who really love their pets. The speakers from Pet Acoustics are billed as the world's first sound system designed to cater to the unique audio sensitivities of dogs, cats and horses. Because pets can hear frequencies that are outside the normal range of the human ear, some sounds can startle pets or cause them discomfort. This system allows you to enjoy your music without causing your pet any discomfort. The company also makes an iPhone app that allows you to play music directly from your iPhone while eliminating frequencies that may annoy your pet. Jackets are great for dogs that will be trekking through snow and rain this winter. Preppy leashes and collars are great for your fashion hound. For the party pooper, a bone-shaped bag holder that's available in zebra and cheetah print. Don't be caught without it. It attaches easily to any leash for party animals of all sizes. Lightbulb Dog Toys, safe chew toy. Silver Dog Food Bin, keeps food fresh and safe from other critters and looks great in your home.